Many Betta breeders, as well as some pet owners, do not think about the Nitrogen Cycle because most of these people are changing 90-100% of their fishes water every few days. Even if you are one of those doing the refular water changes, it is not a bad idea to understand what the nitrogen cycle because all water containing fish will embark on that journey. The regular water changes just keep the cycle at the initial stage. The nitrogen cycle is not difficult to understand, but it may take reading over this article or actually having your tanks go through it for it to really make sense. So do not feel bad, or feel you will never get it. Just be persistent and read this over a few times and see where you end up. Honestly, I read many articles and NEVER got it untill I watched it go through its progression in my barracks. Suddenly the light bulb went on and it made sense. So again, keep at it untill you understand it because most of the health and spawning issues we face can be traced back to a water quality issue. The fact that we call this a cycle should tell you there are going to be several stages that must be progressed through before we it can be complete and we can say a tank is cycled. So lets start at the beginnig and work our way through it. 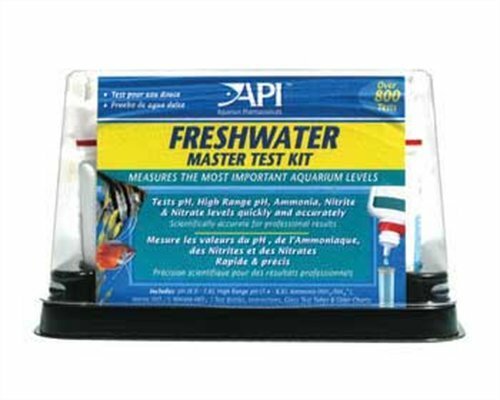 You are going to need a good Master Test kit that will test ammonia, nitrite and nitrate. The Master Kit will also have tests for your pH. Get one that uses drops as they are more accurate than test strips. You will not know where you are in the cycle without a kit, and the first thing anyone will ask you if you have fish problems is what are your water parameters. So best to get this now and understand what you are using the test for. Everything that enters a closed system, stays in the system unless removed. Typically it just changes form. With your fish, any food you give them will be used by the body, and any unused food will leave the fish as waste. This waste will change and ammonia is created. Any ammount of ammonia is toxic to most aquatic life. So if your test kit gives a reading of anything but zero, you now have an issue that needs addressed. With the production of ammonia in a system, bacteria that feed on this ammonia grow in numbers untill they eventually have a population that will convert ammonia produced into nitrite. It takes a litte time for this population to reach optimum levels, so until that happens, the ammonia levels will continue to build. If the rising levels of ammonia are not removed, it will eventually it kill the fish. Even small amounts are harmful and you will often get gill burning and health problems before the fish finally dies. Ammonia as low as .5 will also wipe out fry, and is the bigest killer of new spawns. Untill the bacteria build their numbers you control excess ammonia with water changes. It is difficult to give a percentage of water to change as it depends on the current level of ammonia in your system. All over the internet you will have people tell you to do a 10% all the way up to 100% water change. How do you know what to do? Lets assume your tank has an ammonia level of 1.0. If you do a 50% water change, although your tank will look clean, it still has a level of .5, and it still toxic. In that case 90% would be better and another change the following day to get the level barely above zero. Do you see now where that test kit is going to be a big help in your fish room? So you now are goimg to spend the next few weeks testing the water dai;y and doing water changes as needed to keep it healthy for your fish. As time progresses you will see the ammonia levels start to level off and decline. Bacteria that like the ammonia will have built in numbers and ans should be keeping the ammonia stabilize close to zero. What is happening is those little bacteria are taking in the amonia and turning it into nitrite, the second stage of the cycle. When you first test your water you need to just test the ammonia. In the beginning you will see the ammonia level climb. As the ammonia starts to build less quickly, it is time to test for nitrites as well. 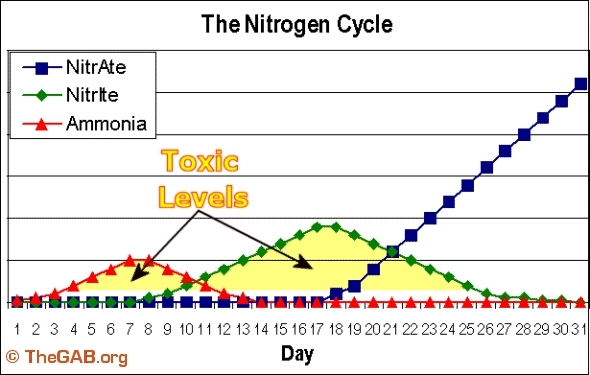 When large numbers of the ammonia eating bacteria start building, the ammoia levels climb more slowly and you start to see the nitrite produced as a result, and you are in entering the second part of the cycle. 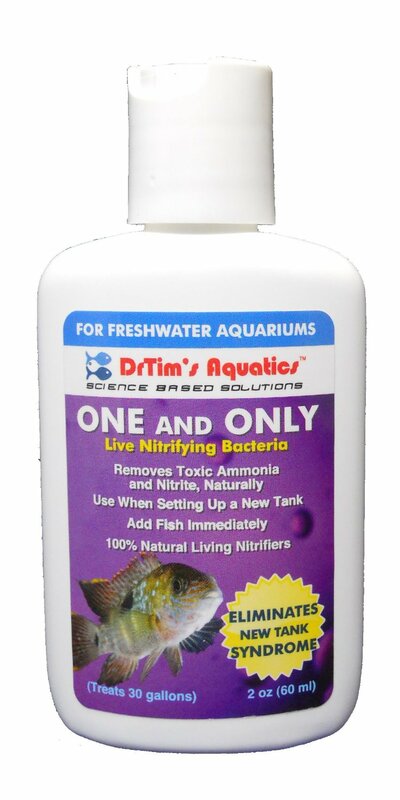 Nitrite is also toxic to fish, so you do not want levels other than zero in this too. Water changes will keep the ammonia levels under control untill the bacteria grow in numbers to handle what your tank typically produces. When you see the nitrite levels start to climb you once again will do water changes to get them back to zero. And, just like what you saw with the ammonia, in time you will start to see this level start to stay steady close to zero. Now a new type of bacteria are growing in numbers that will take the nitrite and consumer it and produce nitrate. How long will it take you to get to this point? Depends on the water volumne and bioload which is the numbers of fish and how often fed. It is not uncommon to take a few months to get to this point. There will be a lot of water changes along the way, but to keep your fish healthy or alive, it will be necessary. Just as you saw with the ammonia, the levels of the nitrites will start to grow more slowly until it too levels off close to zero. During this time your ammonia will also be staying close to zero. As the nitrites start to level off it is now time to test for the nitrates. With the nitrite eating bacteria growing in numbers you will see the nitrate level rise. Now, nitrate is not as harmful as ammonia or the nitrite, and a low level here is generally acceptable. Plants in the water will consume it as fertilizer, but you will also control this level with water changes. By this point you will not have to do daily or even every other day water changes. You should be getting to a point where you can do a once a week water change and keep the system at healthy levels. When you do you water changes this water can be used to water house plants and they will thrive with the nutrients in the water. I have found bamboo to be especially found of this water and will show its happiness with a deep rich green coloring. Once the tank is cycled you should be able to preform a weekly water change and keep all the levels at acceptable levels. Feed your fish moderate ammounts and strive for a regular schedule so your water can adapt to a consistend level of waste that will be produced. At this time you can test every few days until you get to know your tank, then a once a week test just to make sure is my recommendation. If you add any additional fish or decide to feed more heavy, make sure you run some additional tests so you can see if it makes a difference in your water quality. By testing you are in a position where you can do a water change before the system gets unhealthy or critical. Hopefully you were able to follow and understand the nirtogen cycle, and if you are working through one in a tank of your own, you have gotten to the end and have a happy and healthy tank for your fish. It probably took a few months, but it is worth it because your fish are happy and healthy. Should you have any additional questions please feel free to ask them on our forum. So here you are, enjoying your new tank and thinking maybe you want another tank. Or what if you have to break down and start over the one you just did somewhere a long the line. Are there no shortcuts? As you just saw, the cycle is all about certain types of bacteria building to numbers that are able to handle the waste production of your system. The cycle I just took you through allowed nature to prodce and build the bacteria numbers up to aceptable levels for a particular tank. It takes time for the bacteria to develop and grow in numbers to handle the amount of ammonia your tank will regularly produce. 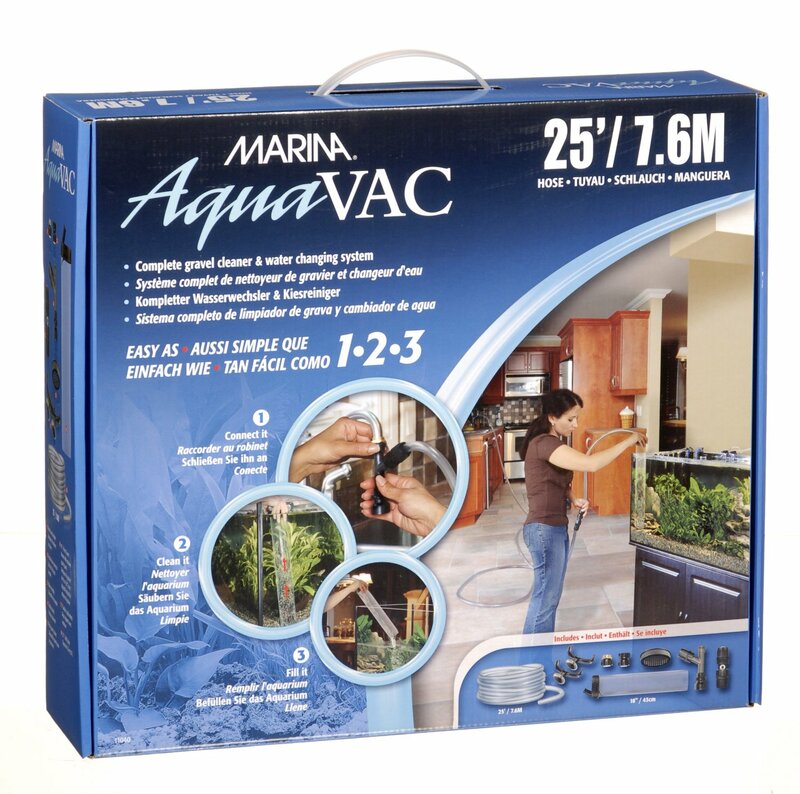 If you want to speed this process up, you can get a products consisting of nitrifying bacteria to seed your tank. Even with a jump start of nitrifying bacteria, you will want to regularly test your water to see where you are in the cycle and maintain the water quality until the cycle completes. I completly cycled a barrack system of 48 fish in about 60 gallons of water in two weeks. using nitrifying bacteria I purchased. A proven product that works well is the Dr Tim’s One and Only shown to the left. Dr Tim has a Ph.D. in nitrifying bacteria and has 16 years of experience in the field. He uses these bacteria to set up huge public aquariums in about a weeks time. For more information on cycling a tank and Dr Tim’s products and research you can see his web page . He also has several information videos like the one above if you want to know more about the nitrogen cycle in a new tank. Once you get your tanks cycled, you want to make sure you do not accidently reduce the numbers of bacteria, or you will end up with a mini cycle until it gets reestablished. Your bacteria will have built up along many surfaces, but the prime place to find them will be your filter and gravel beds. As time goes on most filter media will need to be rinsed to continue to work properly. Always use old tank water or tap water that has been conditioned to removed chlorine and chlorimines. Not only will chlorine kill your fish, but your bacteria as well. A typical gravel siphon should remove organic patter while leaving bacteria pretty much intact. Use care if you decide to treat for fish diseases. Most medications to treat fish diseases will kill bacteria, good and bad. If you are adding meds to treat something like fin rot, you are adding a bacteria killing agent and it will wipe out your biological filtration along with the disease you are treating. Massive die off of these bacteria will cause unhealthy water conditions as they decompose, and the fish waste they were taking care of now is building. It can be a matter of hours to go from healthy to toxic conditions so always use another bare botromed tank as your treatment tank.